The 2.34 kilogram (5.16 pounds) Samsung Series 3 NP350V5C features - at least on paper - impressive hardware: an Intel Core i7-3610QM CPU and AMD Radeon HD 7670M GPU are joined by 8 GB RAM and a hard disk drive with 750 GB capacity. Aside from the spacious hard drive for user data, the notebook (essentially the Intel version of the Samsung 355V5C with AMD CPU) also promises ample processing power. The most notable feature though is the price: some online retailers offer the system for around 800 Euros (~$1015) - quite a bit below the MSRP of 999 Euros (~$1270). Given the price point, Samsung appears to be targeting families with this multimedia system. So are there any downsides to the low price and is the notebook capable of handling mobile multimedia tasks? The first impression is a good one: The smooth and reflective lid is enhanced by a metal texture and looks quite upscale; The body and the display bezel feature a pleasing dark silver design. 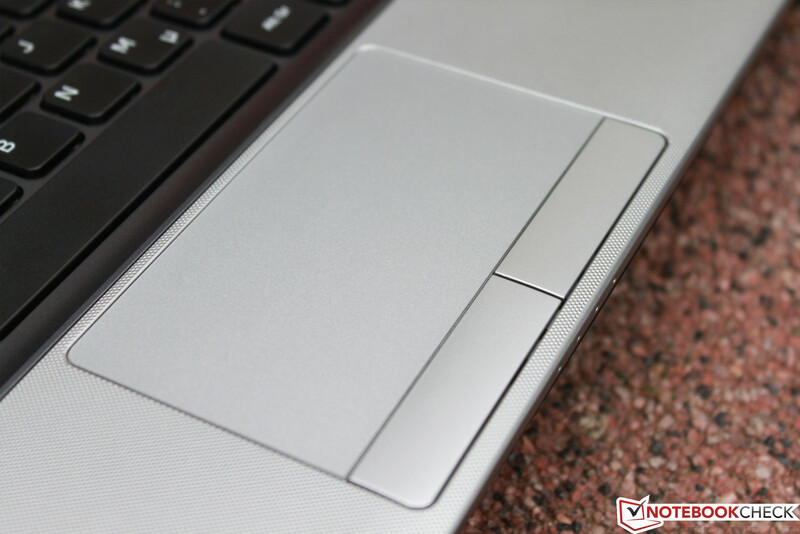 Upon closer inspection it becomes clear that some cost-cutting measures had to be taken to keep the weight down: not only is the display not torsionally rigid, but the body also flexes a fair amount in the area of the keyboard and the palm rest. The display hinges, however, are able to hold the display securely so no annoying wobbles occur when the user is sitting in a train or car. 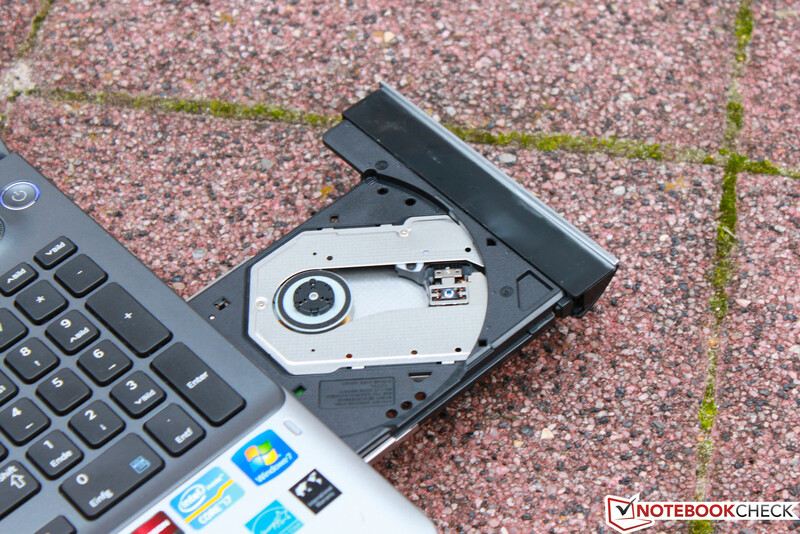 We are not overly impressed by the DVD optical drive, as the internal mechanism produces scratching sounds when loading and unloading disks. Less noticeable, but a bit of an eyesore are two little raised bumps on the sides of the palm rest - probably results of the manufacturing process. 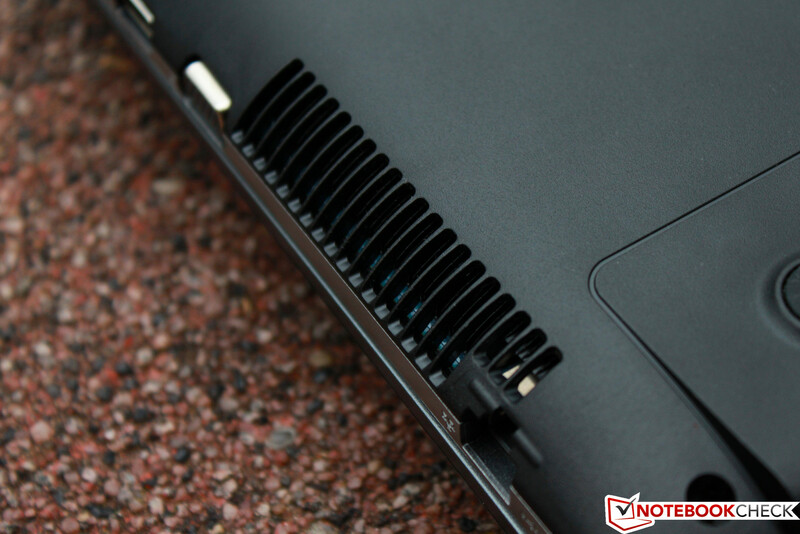 When we reviewed the AMD version Series 3 355V5C, we had similar issues with the quality of the chassis: we noted uneven gaps in the plastic and a sharp edge. 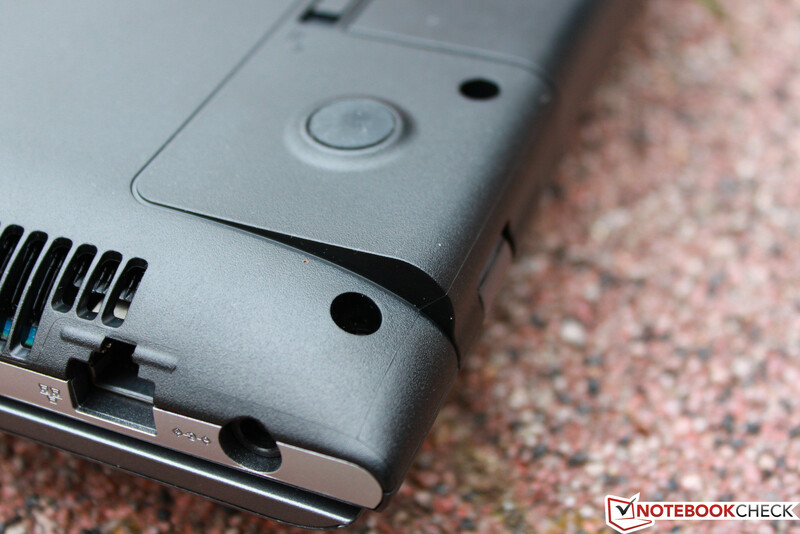 The NP350V5C only has one (larger) gap on the left side between the keyboard and the body. The area where the keyboard sits and the palm rest itself are not very resilient and can be pretty easily deformed (pushing on the palm rest with medium pressure results in the whole forward section of the notebook bending). We doubt that a change in the production cycle can be blamed for the difference between the two versions, as not a lot of time passed between our two reviews. When we checked another sample at a local computer retailer, we noticed some differences in our review model (stiffer display hinges, softer chassis around the speakers). We now think that production variances are to be blamed for the slight variations from unit to unit. 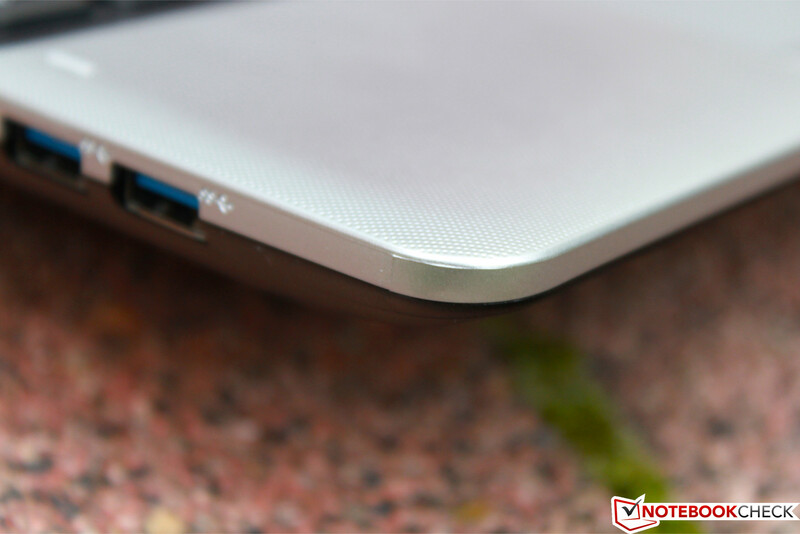 The 15-inch system features a variety of ports - we particularly like the two USB 3.0 ports on the left side. 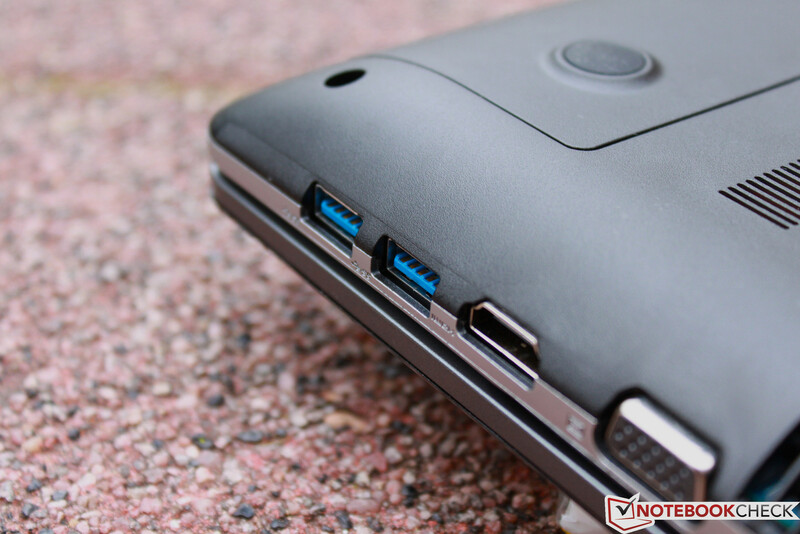 For output to external monitors, the user can either use the VGA or the HDMI port. 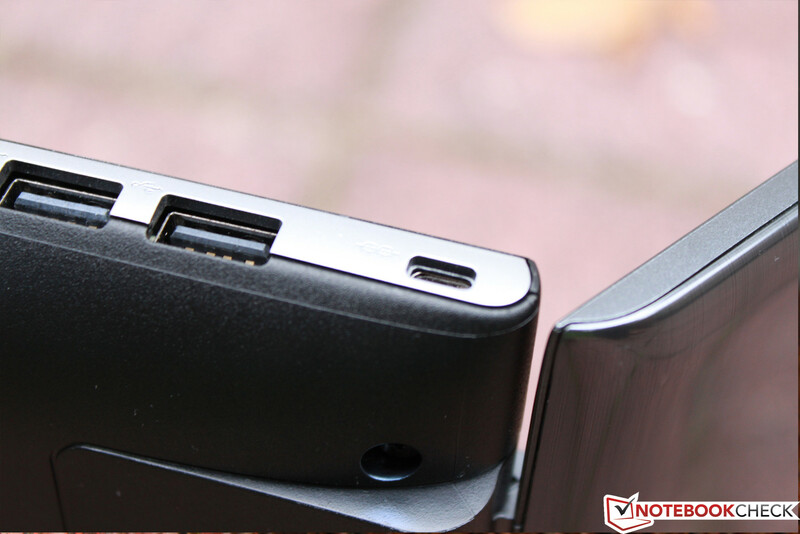 The right side is home to another two USB ports - this time USB 2.0. 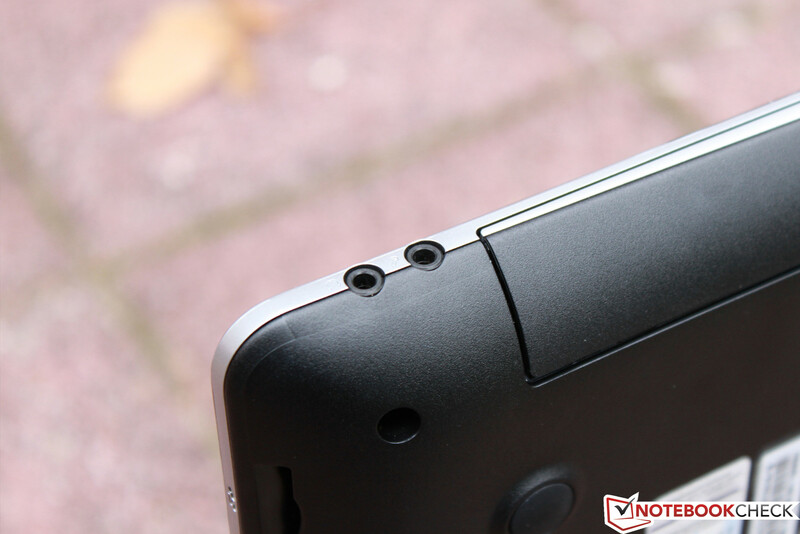 The ports are located towards the back, which right-handed users might appreciate. Samsung forgoes the audio combination jack (found on many subnotebooks), and includes two standard audio jacks instead, which means that almost all regular headsets can be used. 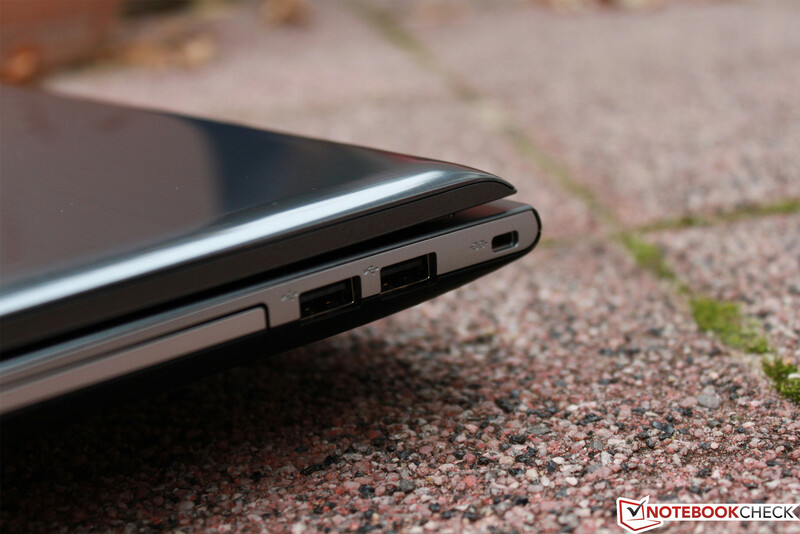 The layout of the ports is well thought out, although left-handers might have some issues when a monitor is connected via VGA or HDMI, since the cable might occupy the workspace. 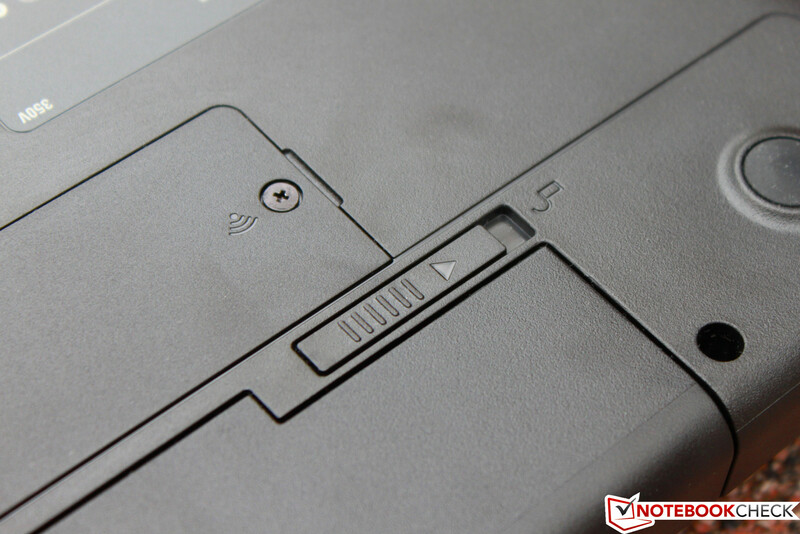 There are no ports on the back or the front - save for a 4-in-1 card reader underneath the right palm rest. Like most current notebooks, the Samsung Series 3 NP350VC connects via wireless with the outside world. Tasked with this job is the Atheros AR9485WB-EG Wireless Network Adapter, which supports draft b/g/n and Bluetooth 4.0. Should a cable-bound connection be preferred, the integrated Realtek RTL8168/8111 supports speeds up to 1000 MBit. The webcam (a 1.3 megapixel model) natively only supports VGA resolution (640x480) and uses interpolation to get to the promised pixel count. Even though the quality is OK, we still would have preferred a higher (native) resolution. Despite the low price, Samsung still includes accessories: aside from the usual quick start guide, the booklets with safety and warranty information, and the power adapter, the box also includes a recovery disk. The system also includes some bloatware: CyberLink Media Suite (full version) and Norton Internet Security (60 day trial). In addition, there are also some games from WildTangent preinstalled on the hard drive. Samsung also includes their own software: "Easy File Share", "Easy Migration", and "Recovery Solution 5" to name the important ones. The first one in that list allows file sharing via Wi-Fi, the second one is a clone program, and the last one allows the user to create backups of the system and restore them if needed. 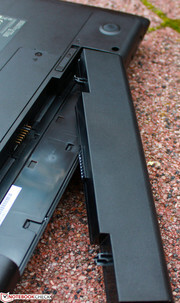 The underside of the notebook features two maintenance covers, which can be removed with a regular Phillips screwdriver. 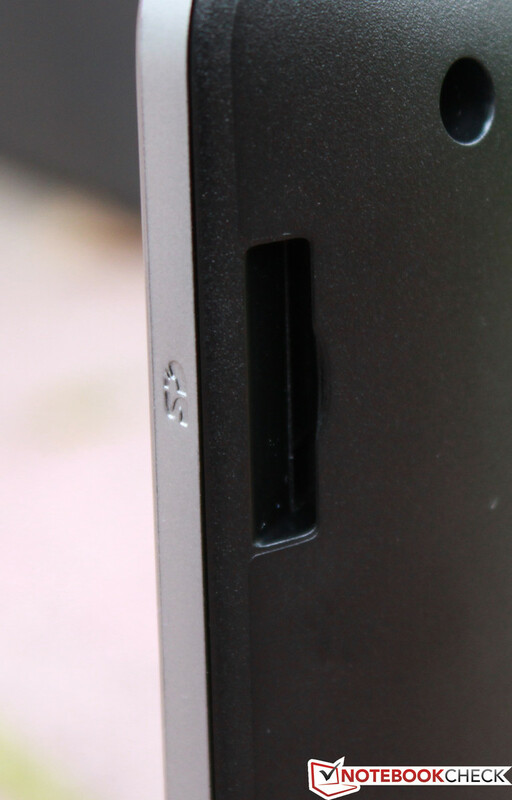 The smaller one allows access to the wireless module, while the other one covers the hard drive, the RAM slots, and allows replacing the DVD optical drive. 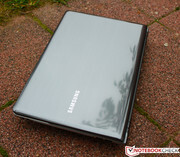 Samsung covers the notebook with a standard warranty of 24 months (in Germany). This warranty can be extended to 36 or 48 months (100 Euros / ~$130) and 48 months with next business day service for 250 Euros (~$320). Samsung uses a modern chiclet-style keyboard with a fairly normal layout. We are not a fan of the arrow keys, as they are not quite deep enough. Samsung also omitted the right Windows key next to the space bar - we doubt that any users will miss that key very much though. The PgUp, PgDn, End, and Home keys are located right above the numeric keypad. The keystroke is well defined but the keys are nonetheless a bit on the soft side. 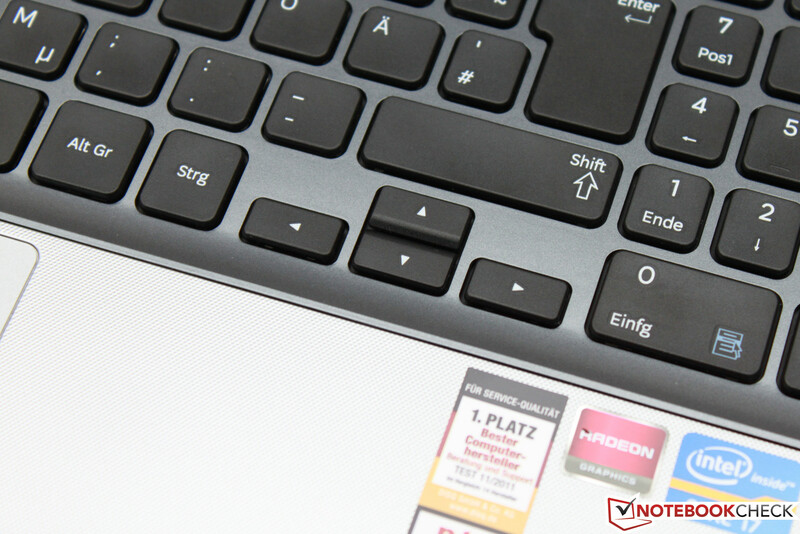 The F-row keys - just like on most notebooks - offer additional functionality and control volume, screen brightness, and wireless (among others) if the Fn key is pressed at the same time. 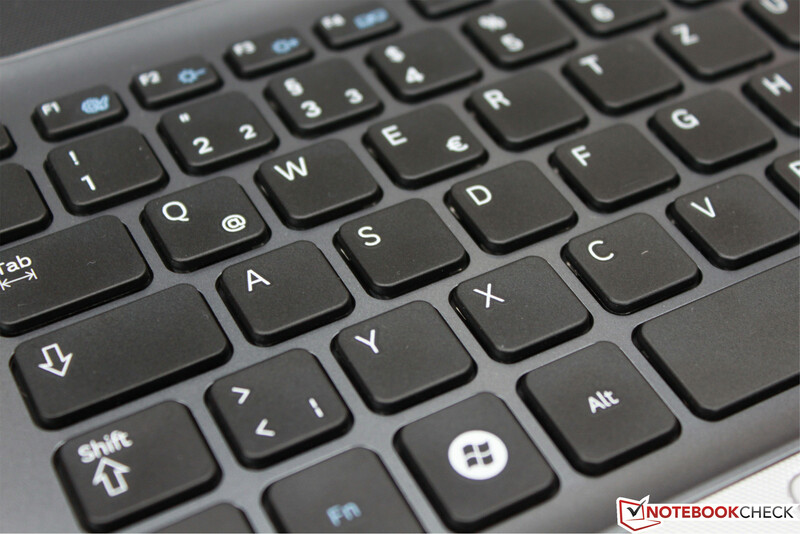 The one real point of criticism we have though is the softness of the keyboard around the numeric keypad. The rest of the keyboard doesn't flex nearly as much when pressure is applied. The reason for this behavior is most likely (as we hinted before) a direct result of the low weight of the notebook. Unfortunately, the touchpad is also far from perfect: even though it's generously sized, its silvery surface - which appears matte to the eye - does not allow fingers to glide smoothly. Aside from the sluggish reaction, the usability of the pad also doesn't extend all the way into the perimeter, but stops about 5 millimeters (0.2 inches) short. 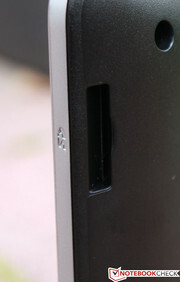 The mouse buttons appear cheap - they are not firm enough towards the outside, and are somewhat undefined and "clickety". Our overall impression of the touchpad is unfortunately not favorable. 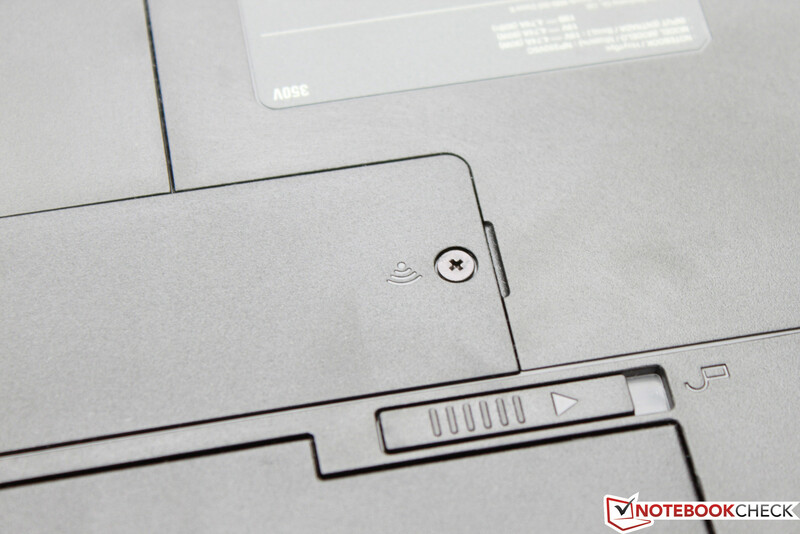 Interestingly enough, the touchpad on the AMD-equipped NP355V5C was quite different: we could use the entire surface and the buttons appeared to be higher quality. As far as usability is concerned, we noted that users with cold and dry fingers had a much harder time with the touchpad than others. We are still a little perplexed why there is such a difference between two pretty much identical models. 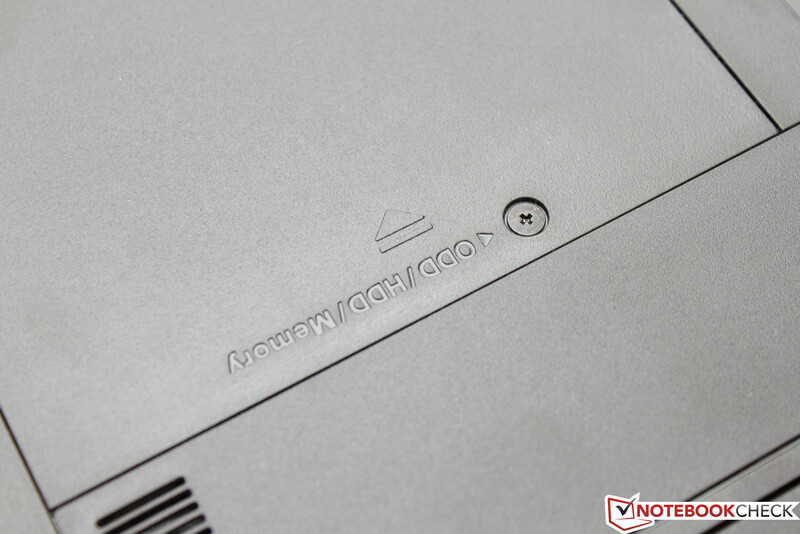 Samsung uses a non-glare panel (AUO B156XW02 V1) with LED backlight. We appreciate the matte design as annoying reflections are not an issue. The 15-inch display features a resolution of 1366x768 pixels - a sharper Full HD panel would have been a nice touch (maybe in conjunction with an external Blu-Ray optical drive), but given the price point and the hardware this really can't be expected. We measured an average brightness of 211 cd/m² for the matte display - pretty standard for low-cost panels. Brightness distribution is only average at 82 percent, but not really noticeable during daily use. The contrast is decent for a panel in this category - we measured 296:1. The black value of 0.76 cd/m² promises saturated blacks - due to the low average brightness, dark movie scenes are hard to make out, however. The display comes fairly close to covering the sRGB color space, but - just like the Dell Vostro 3560 - misses Adobe RGB by a fair margin. 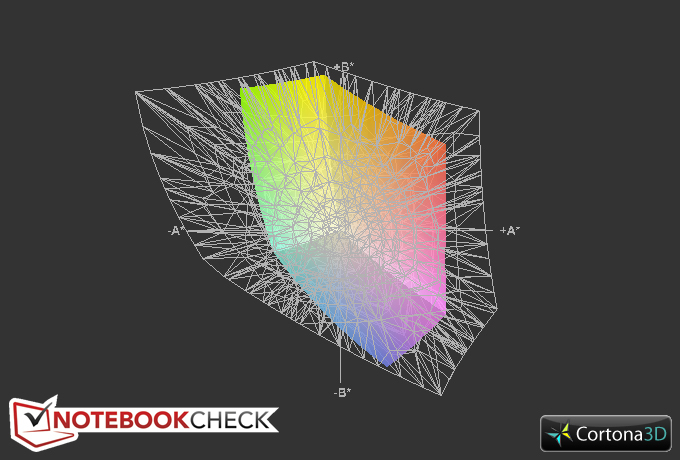 Color spaces are really important to those working with graphics and similar software - and professionals will most likely look elsewhere anyway. 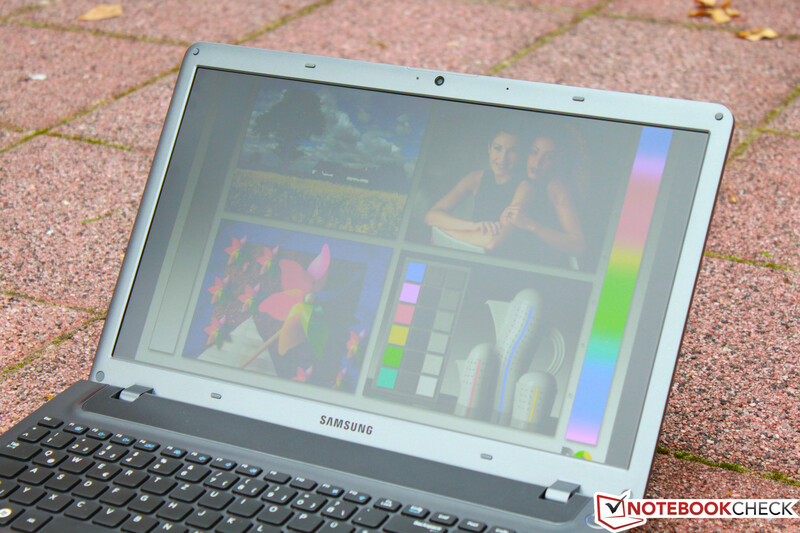 Even though Samsung uses a matte panel for their Series 3 350V5C, working with the notebook outside when it's really bright is only possible to a limited extent. The reason is the low average brightness. Especially in direct sunlight the display doesn't fare well at all. Normally bright environments are less of an issue - the display remains readable even though dark colors appear muted. Multimedia notebooks in particular require decent viewing angles to allow a group of users to enjoy a movie while on the go (while on a train ride, for example). The panel gets some things right: deviating from the center axis to the left and right does not cause colors to invert – although the screen gets significantly darker around 30 degrees. Since the display can only be tilted back to about 125 degrees, the possible viewing angles from above don't really matter much, although colors invert early. From below, the user will be subjected to color inversions at about 60 degrees. The aforementioned limitations are not really a deal breaker – considering this is a low-priced multimedia notebook, the display actually does pretty well. Aside from the lack of brightness, which makes some dark scenes in movies very hard to identify, the matte panel won't cause too many frustrations if the user should decide to watch DVDs while on the road. The measurements we conducted show a slight difference between this panel and the one used on the Samsung NP355V5C - the reason is an actual difference in hardware: the AMD version uses an AUO B156XTN02.1 "SuperBright" LED Display, our review model features an AUO B156XW02 V1. Samsung equips their multimedia notebook with an Intel Core i7-3610QM, 8 GB of RAM, and a dedicated AMD Radeon HD 7670M - potent enough hardware to put the 350V5C in the middle to upper echelon as far as performance is concerned. Even more intensive multimedia applications (like video rendering, for example) should therefore not pose any problems for the system. Users who are willing to trade in some power for a lower purchase price can also opt for a version of the model with Intel Core i5-3210M. 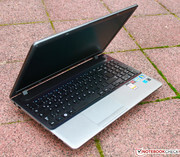 Versions of the notebook from other countries, which are also offered in Germany, come equipped with the Intel Pentium B970 or the Intel Core i3-2370M, but forgo the dedicated AMD Radeon HD 7670M. Samsung also offers the Series 3 NP355V5C with AMD's Trinity processor series - from the dual-core AMD A6-4400M or AMD A8-4500M to the quad-core AMD A10-4600M. The Intel Core i7-3610QM is a quad-core CPU with a core frequency of 2.3 GHz. 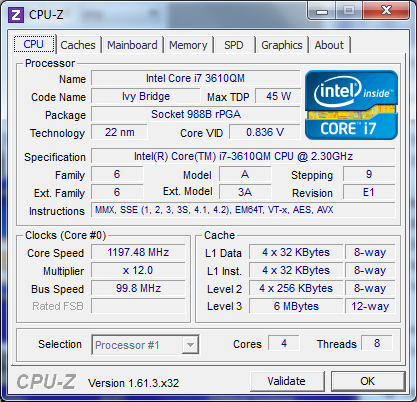 Turbo Boost can overclock a single core to 3.3 GHz and all four cores to a maximum of 3.1 GHz. The processor is part of Intel's Ivy Bridge architecture and manufactured using the 22 nanometer process, which leads to enhanced energy efficiency. To determine the actual performance of the CPU, we use the 64-bit versions of the tools Cinebench R10 and R11.5, which are 3D rendering tests. Using all four cores, the CPU scored 21449 and 6.23 points, respectively - enough for a placement towards the upper end of the middle class (we use all the notebooks with the same processor in our test database for comparison purposes). The result for the single-core tests are only slightly different: in the older Cinebench R10 and newer Cinebench R11.5 tests, the CPU scores 6534 and 1.35 points, respectively. Interesting is the reduced Turbo Boost in single-core mode: instead of overclocking the core to 3.3 GHz, we saw 3.2 GHz as the top (and 3.1 GHz as the lower limit). 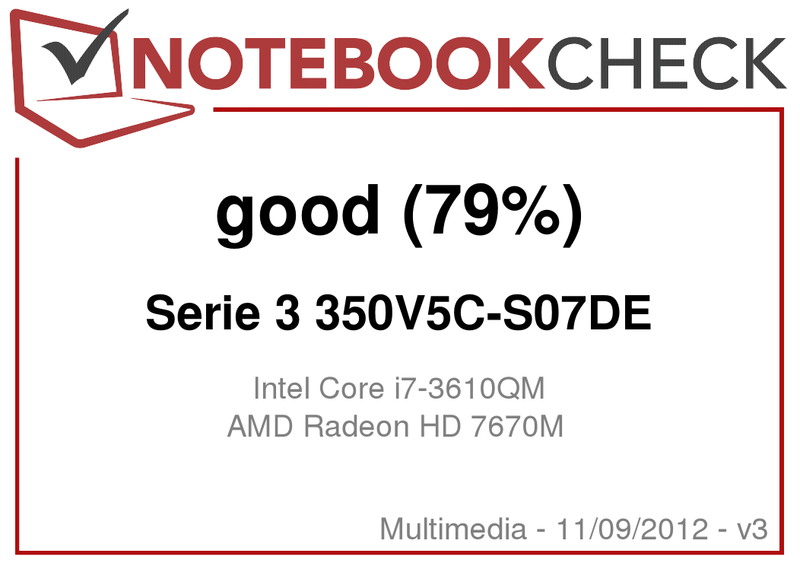 When we unplugged the power adapter, the performance of the notebook was reduced by about one third: instead of 6.23 points, we now saw 4.59 points (Cinebench R11.5 Multi). The graphics performance decreases by a similar margin (see the sections on GPU Performance and Gaming). To determine the overall system performance, we use PCMark Vantage and PCMark 7. In the first benchmark test, the NP350V5C scored 8577 points, which is in line with what we would expect from this type of hardware. The HP Pavilion g7-2007sg outscored our review model, even though it only has a marginally faster CPU (9124 points - about 6% faster). When we ran PCMark 7 for one hour, the result was disappointing: our review model only scored 2295 points - pretty far behind some other systems with the same CPU and similar graphics card. 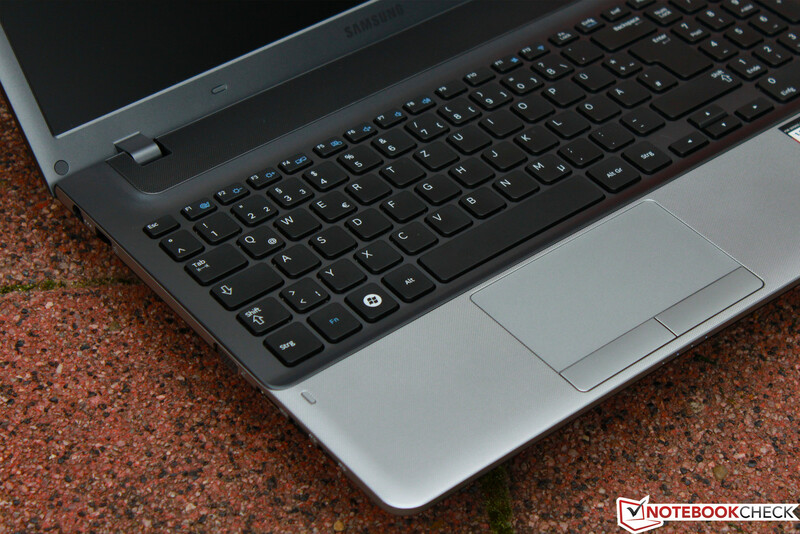 The HP Pavilion g7-2007sg received 2760 points and is faster by about 20 percent. The reason for the fairly mediocre performance is the 5400 rpm hard disk drive: even though transfer rates are decent, access times are not (see the section on Storage Devices). 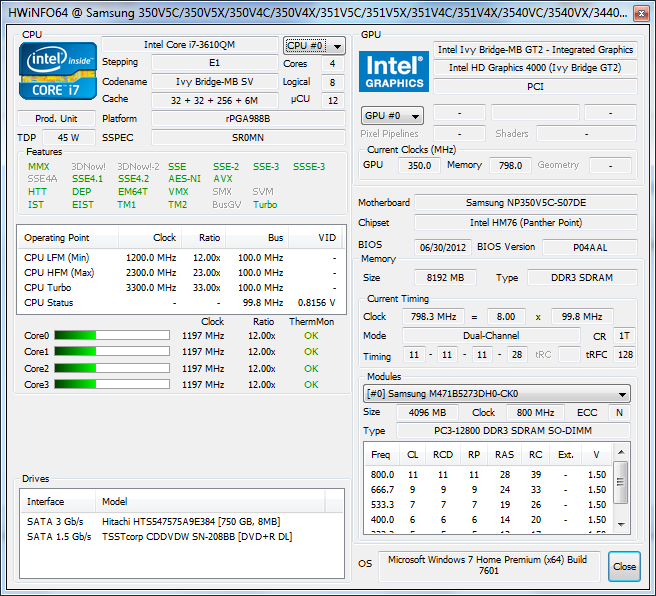 The HDD that Samsung uses in the NP350V5C-S07DE scores, according to PCMark Vantage, only 3217 points. 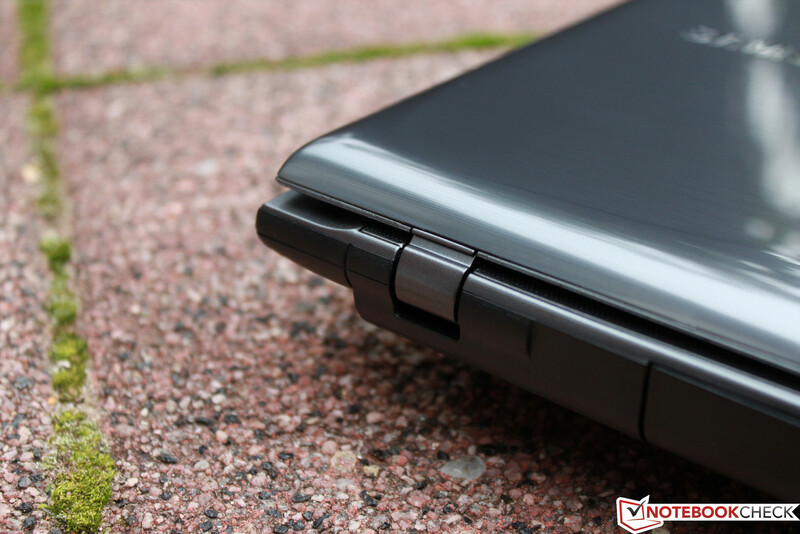 What baffles us though is the fact that HP's ProBook 4740s - which features the exact same hard drive - managed to score much better (3685 points - a plus of 15 percent). To try and verify the result, we also took a look at the System Storage Score component of the PCMark 7 benchmark test. The sub-score of 1422 points is also comparatively unimpressive - although other systems with the same hard drive also only manage to score between 1400 and 1430 points. The ProBook 4740s is again faster than all the other systems and scores 1470 points (this time, the plus is only 3 percent). Not really surprising, the performance of the NP355V5C-S05DE - equipped with an AMD A6-4400M - lags behind the Intel version by a fair amount. The lower performance of the processor results in scores of 4801 points for the PCMark Vantage and 1600 points for PCMark 7 test. 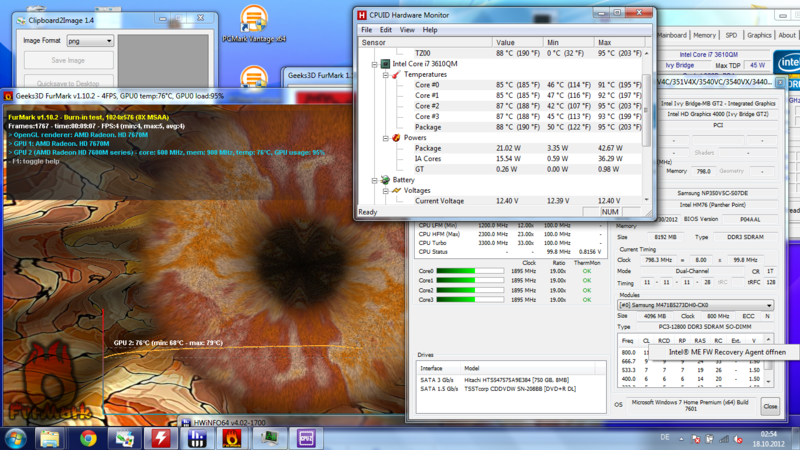 The version of the notebook with AMD APU is considerably slower than our review model with the Core i7-3610QM. Our review model is equipped with a 750 Gigabyte Hitachi Travelstar 5K750 HTS547575A9E384. The platter-based drive spins at 5400 rpm, which generally leads to moderate transfer rates but benefits power consumption. 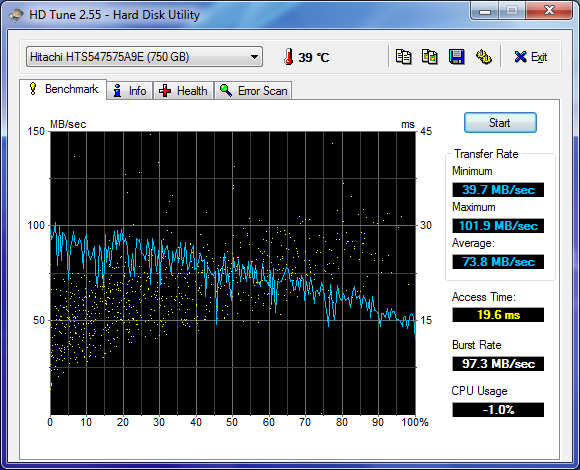 HDTune reports an average transfer rate of 73.8 Megabytes per second, which is a bit above average for a 5400 rpm drive. We were not impressed at all with the access times: 19.6 milliseconds is quite slow. 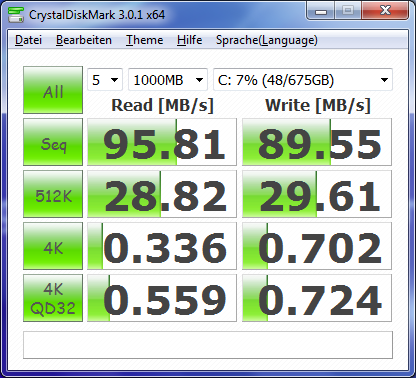 CrystalDiskMark more or less confirms the results: the hard drive is fast as far as the transfer rate is concerned - but quite slow when the data needs to be accessed again. For more details on performance please check the HDD/SSD benchmark list in our FAQ section. The 350V5C uses a dedicated AMD Radeon HD 7670M as its graphic engine. The GPU, which is still manufactured using a 40 nanometer process, supports DirectX 11 and utilizes two Gigabyte Hybrid GDDR3 RAM (more commonly we see just one Gigabyte). We use 3DMark06 and 3DMark Vantage to evaluate graphics performance. In the former benchmark test, the GPU returned 8218 points - a place right behind the Dell Vostro 3560, which uses the same graphics card and scored 8270 points. 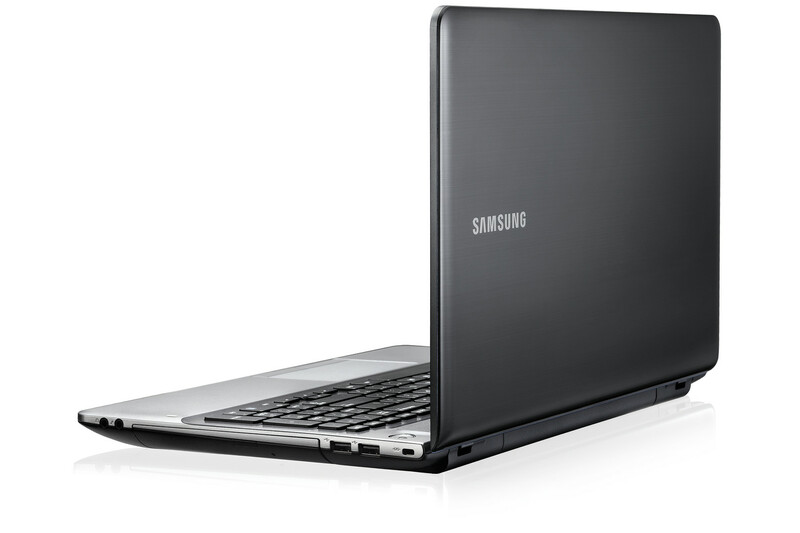 The Samsung notebook placed in the upper middle range of our performance database. The score from the 3DMark Vantage benchmark is 4250 points - again behind the Dell (4370 points). Here the notebook placed in the lower middle range, although still ahead of the HP Pavilion g7-2007sg (4207 points). Somewhat surprising was the result when we ran the notebook on battery power: 2405 points is a substantial decrease from the aforementioned 4250 points. We saw similar results when we tested the gaming performance (see below). Thanks to the dedicated GPU, we saw frame rates of about 35 fps playing Skyrim on medium while the notebook was connected to external power. As soon as we switched to battery, the frame rate dropped by nearly half down to 19 fps. Consequently, the game is only really playable on low to keep the frame rate acceptable (31.6 fps) - medium settings while on battery resulted in lower frame rates than what we saw on high with the power adapter connected (23.4 fps). To test performance with less demanding games, we chose Dirt Showdown and FIFA 13. The former achieved a frame rate of 38.1 fps with the settings on high - definitely playable, but approaching the limits of the graphics system. The soccer game FIFA 13 posed no problems for the GPU and maintained a high frame rate (112.8 fps) even with the settings on high. The Samsung Series 3 NP350V5C is certainly capable of handling some of the more current games - the only caveat: the notebook needs to remain plugged in. For more demanding games, the user is going to have to choose medium or low quality settings in order to have a decent gaming experience. When performing office-type tasks and during idle, the cooling system of our review model remains unobtrusive and quiet - we measured 32 to 35 dB(A). When Samsung's "Eco Mode" is enabled, the fan doesn't spin at all - in which case the hard drive is the most noticeable component, as it emits a fairly loud clacking sound when first accessed. When the notebook performs more demanding processor and GPU intensive applications, system noise increases to a maximum of 42 dB(A) - definitely audible, but not overly annoying. The notebook gets comparatively warm even during idle: we measured 39 degrees Celsius (102.2 degrees Fahrenheit) on the bottom near the fan exhaust. As soon as load increases, the temperature goes up to 43 degrees Celsius (109.4 degrees Fahrenheit) around the left palm rest area and to 49 degrees (120.2 degrees Fahrenheit) on the bottom of that section. 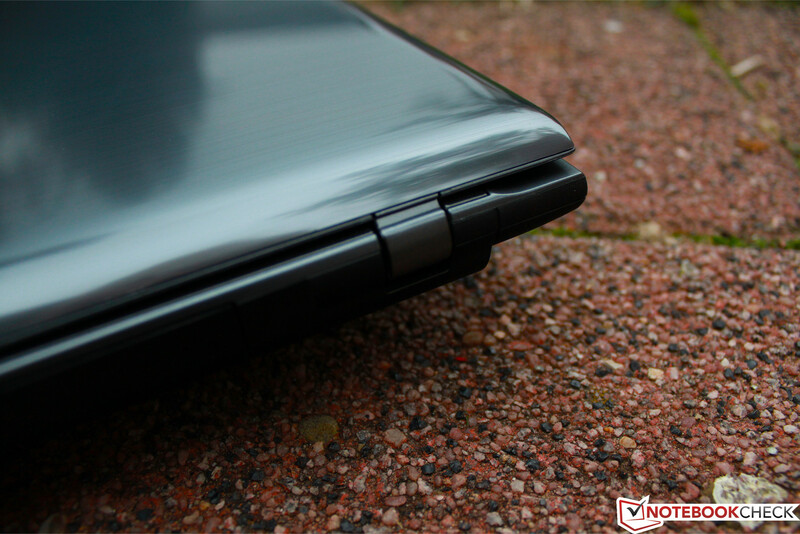 Other notebooks have similar issues, however: the Dell Vostro 3560 (our review model featured an i5-3210M) surpassed 50 degrees Celsius (122 degrees Fahrenheit) under load. We were curious to see how the system would handle high loads and being pushed to its limits, as this scenario potentially induces a reduction of the clock speed of both CPU and GPU. Because of the form factor, we expected throttling to occur even at the beginning of our stress test - it didn't turn out to be much of an issue, though. The GPU maintained 600 MHz and actually cooled down a bit as the test progressed; the processor didn't surpass 88 degrees Celsius (190.4 degrees Fahrenheit) and the frequency reduction was moderate (1.9 GHz per core instead of 2.3 GHz). Considering how slim the notebook is, the results are quite positive - which is also true for the 3DMark06, which we ran right after the test: 8230 points is actually slightly better than what we recorded right after a cold start (8218 points). We wouldn't expect a noticeable reduction in performance during daily use caused by throttling. 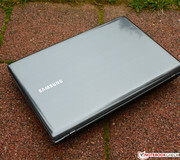 The speakers of the Samsung Series 3 350V5C suffer (as most notebook speakers do) from a severe lack of bass. 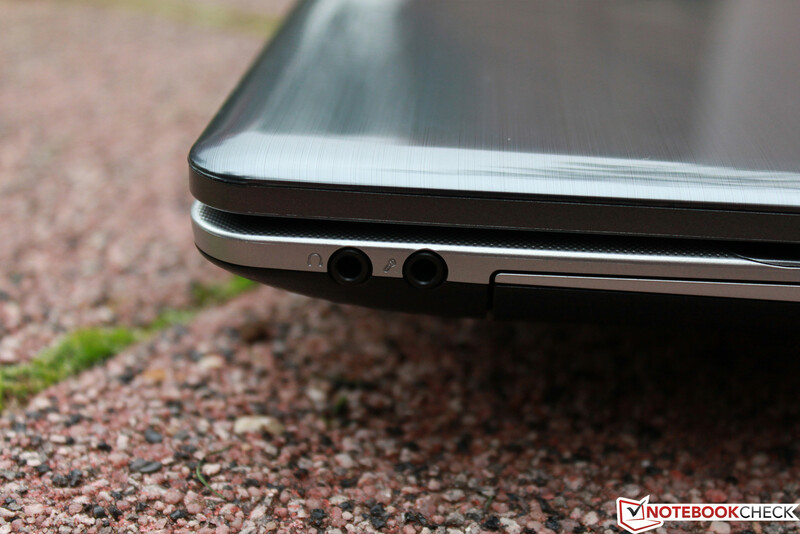 Compared to other notebooks, however, the 350V5C produces mids and highs which are slightly above average - but even so, the overall sound is somewhat artificial. When we used TEDtalks for recording purposes, the speaker's voice was clearly audible - as soon as we switched to an external headset, the voice was very bass heavy. Both headphones and a microphone are easy to attach on the right hand side of the notebook using the corresponding audio jacks. Power consumption is not only important for the environment - it also gives insight into how energy efficient the system is going to be while running on battery power. 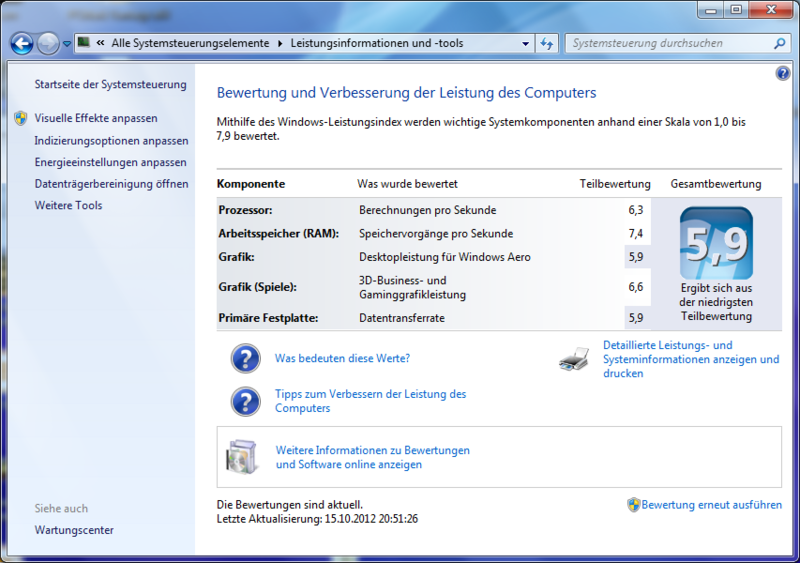 During idle and while in "Eco Mode", the Series 3 NP350V5C uses less power than the Vostro 3560 and the Inspiron 15R Special Edition (although not any less than the Samsung Series 5 550P5C-T02). 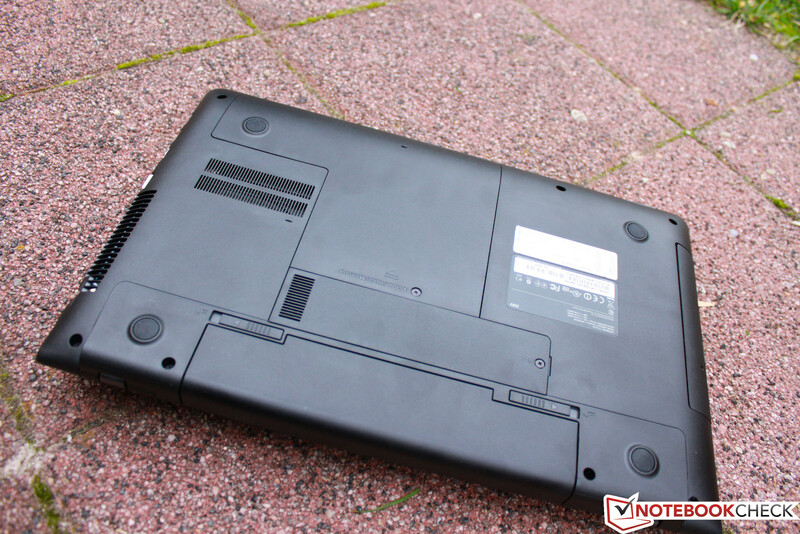 When subjected to full load, the notebook consumes up to 73.1 Watts - a value that can't be easily compared to the other models mentioned above as the hardware is different. 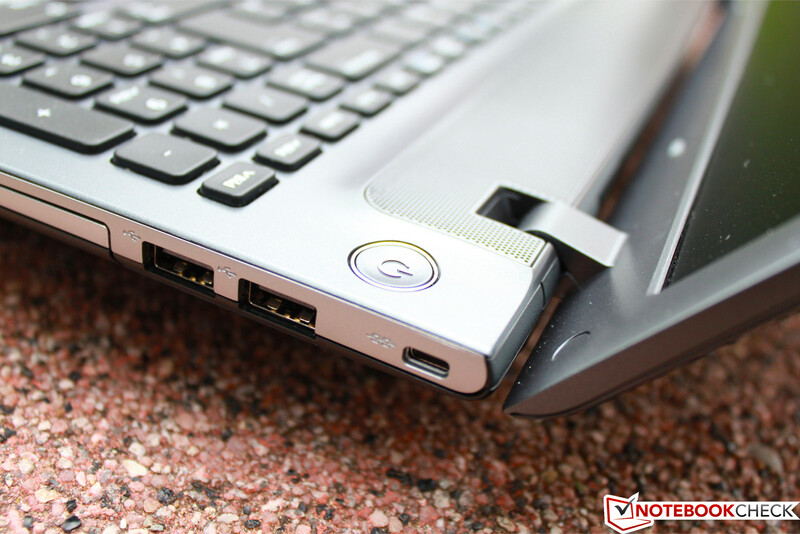 The Vostro 3560, for instance, was reviewed with the i5-3210M (although a version with the i7-3612QM is available). The power adapter is rated for 90 Watts, which is adequately dimensioned, and should offer enough headroom. The AMD equivalent of our system (the Series 3 355V5C-S05DE) consumes less power overall: we recorded between 14.1 and 67.1 Watts (idle / load). A 15-inch multimedia notebook (especially one that's comparatively light at 2.34 kg / 5.16 pounds) should have decent battery life for extended mobile use. The 5 hours and 39 minutes we recorded while the notebook was idling is above average - the Samsung places ahead of its competition here. 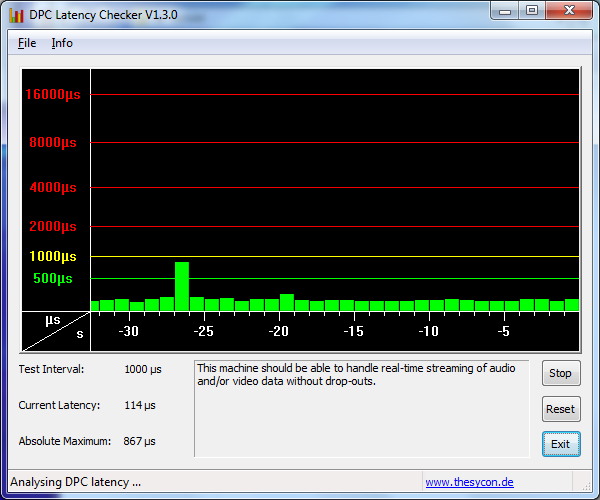 The WLAN test also shows a very good result: 4 hours and 19 minutes. 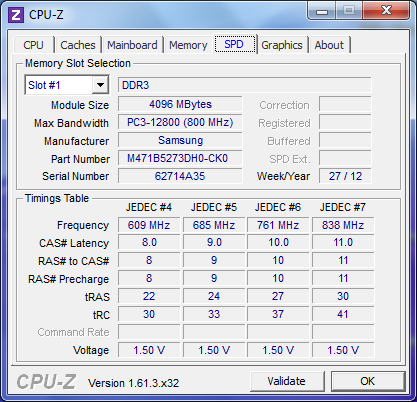 The Samsung Series 5 550P5C, however, did last about half an hour longer. The AMD-equipped Samsung Series 3 355V5C-S05DE managed to last 2 hours and 30 minutes longer - but didn't show nearly as much stamina during the wireless surf test (3 hours and 15 minutes) and the DVD test (2 hours and 22 minutes). The aforementioned DVD playback test - which we consider to be one of the most important tests for a multimedia notebook - was quite impressive as well: 3 hours and 19 minutes. The Series 5 550P5C did even better here and managed to last one hour longer. Even though the notebook exhibits some throttling under full power, we weren't impressed with the results of the Battery Eaters Classic Test (which simulates full load and stresses all four cores of the 3610QM) we recorded 1 hour and 13 minutes. 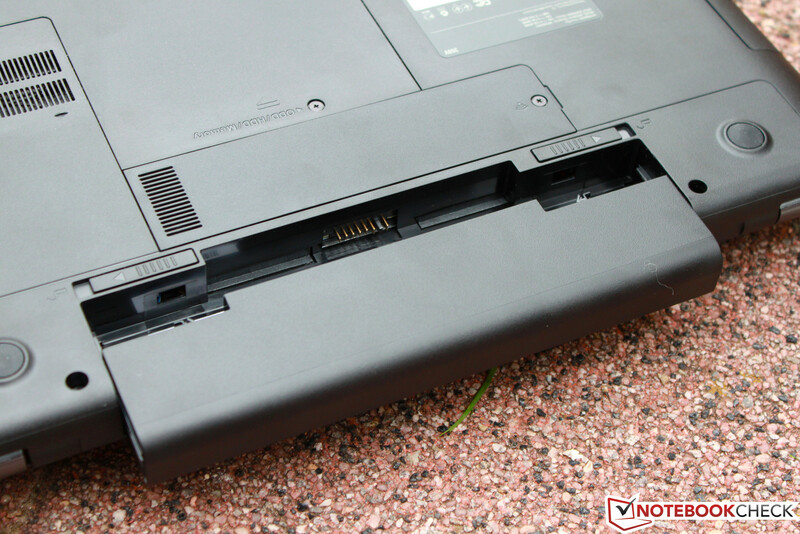 This means that all other competing notebooks - save for the Dell Inspiron 15R Special Edition - last longer. It could have been perfect: low weight, decent enough build quality, long battery life, good looks, a dedicated graphics card, and a good price-performance ratio - we even would have overlooked the lack of stability and rigidity in the design. 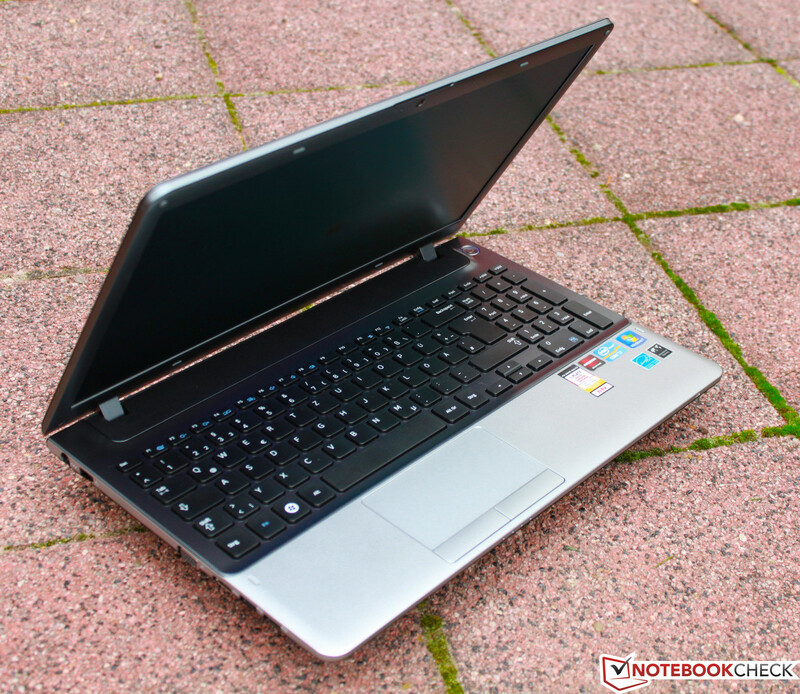 The multimedia notebook manages to get most things right and could have been a very good solution for watching movies, editing videos, and the occasional gaming. But gaming while on battery power is where the notebook disappoints: full power is not usable because both the processor and the graphics card throttle their output significantly - the user is forced to lower the quality to counteract the performance loss. Those who can live with this limitation will find more to like than just the design of the NP350V5C-S07: the street price of around 800 Euros (~$1000) is certainly very fair; resulting in limited competition. The Dell Vostro 3560 can be had with similar hardware and a brighter display (matte, Full HD) - but it weighs more, costs about 50 Euros (~$65) more, and doesn't last as long on a charge. 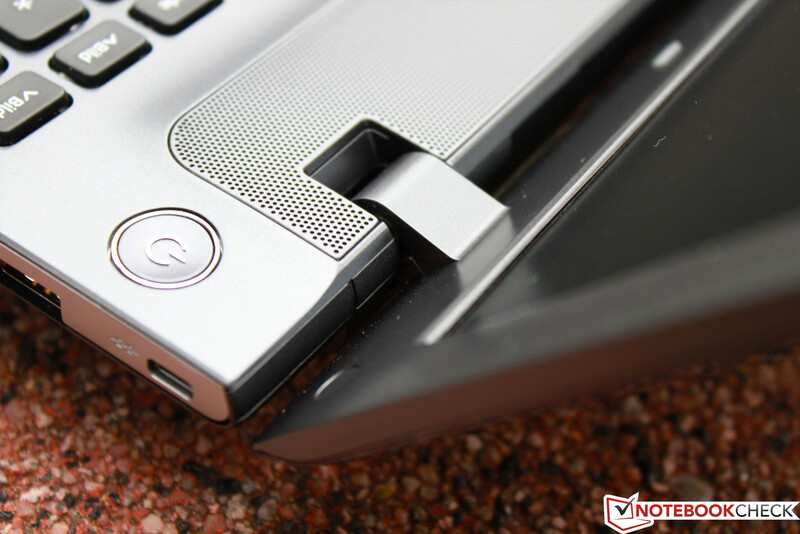 The Dell Inspiron 15R Special Edition features a better graphics card but is more expensive and heavier, while the battery life is shorter and the build quality lacks somewhat. If systems with a 17-inch screen are an option, either the HP Pavilion g7-2007sg (750 Euros / ~$975; glossy-type display) or the Acer Aspire V3-771G-736b8G50Maii deserve a look. If the price is critical and less powerful components and lower battery life are not an issue - but the design is - the NP355V5C with AMD hardware could fit the bill. The long battery life, the potent hardware, the design, the low weight of 2.34 kilograms (5.16 pounds) and lastly the price of the Samsung Series 3 NP350V5C are all positive attributes. If the user can accept the performance limitations when the notebook is unplugged, the not very bright (but fortunately matte) display, and the lack of rigidity, the notebook certainly is an option and warrants a look: no other notebook featuring the same form factor offers comparable performance for the same price. ...especially the arrow keys are a bit undersized . ...the 1.3 megapixel webcam allows video conferencing. A Kensington Lock offers a bit of physical security. ...hard drive, optical drive, and RAM. ...the fan noise is well controlled. ...of 2.3 kilogram (5.07 pounds). ...we find the stereo speakers. 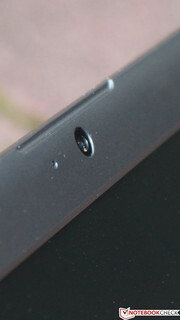 ...via the 3.5 mm headphone jack. ...by pulling it out towards the rear. The low weight and very fair price. 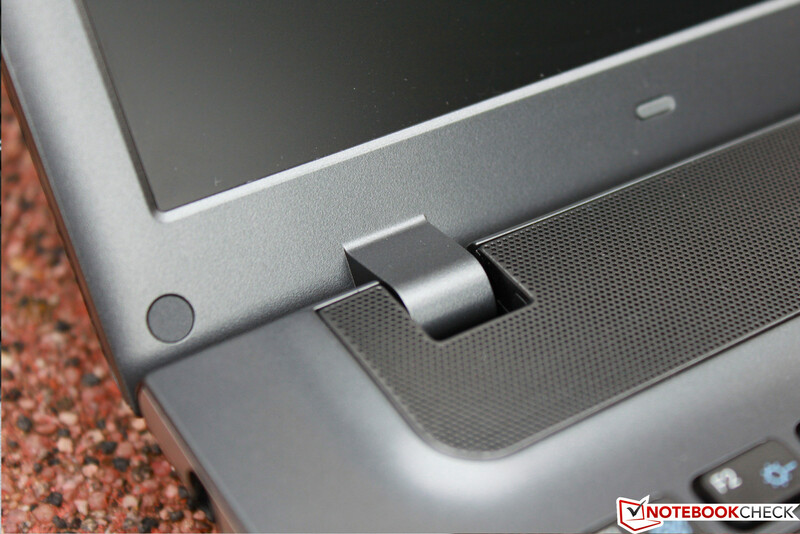 Higher rigidity and resilience - especially around the keyboard area and for the display lid itself. How much performance gets reduced when the notebook is running on battery power. 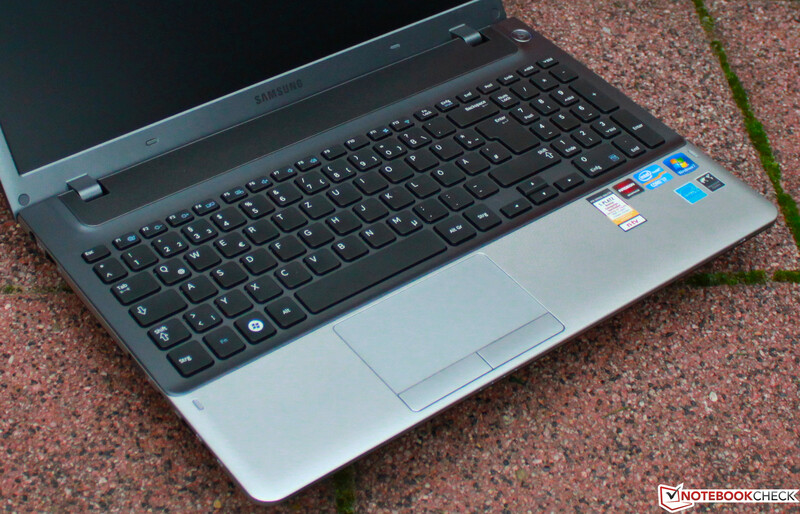 Notebooks with the same form factor and similar performance: Dell Inspiron 15R Special Edition, Dell Vostro 3560, Samsung 550P5C, MSI GE60-i789W7H, as well as Samsung Series 7 700Z5A. 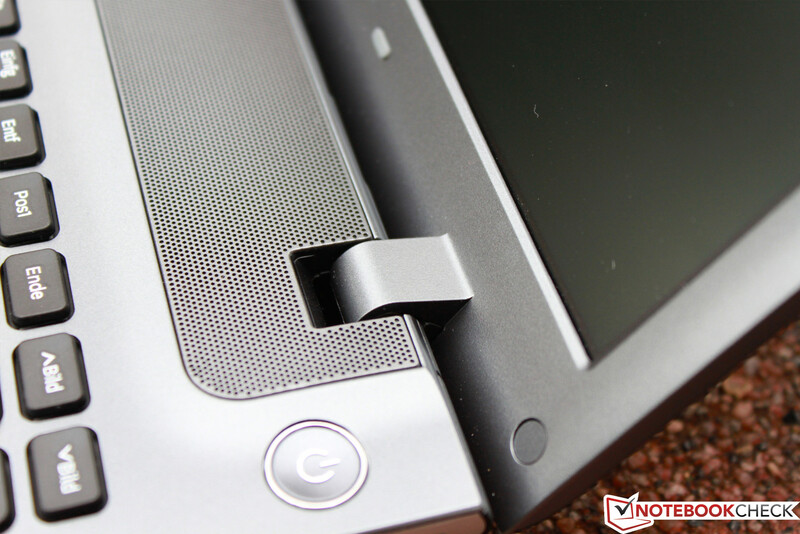 If a larger screen is desired: HP Pavilion g7-2007sg or Acer V3-771G-736b8G50Maii. If a smaller screen is an option, the Acer TravelMate P643-MG-5324G75Mikk might warrant a look.